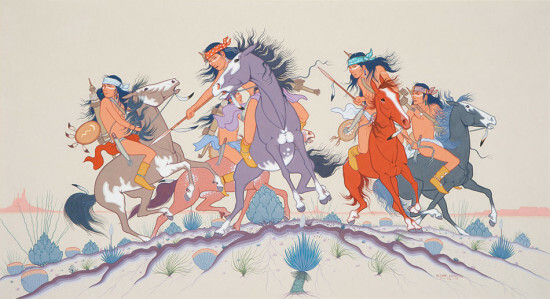 Allan Houser: A Celebration is an ongoing exhibition at the Philbrook Museum of Art in Tulsa that honors the paintings and sculptures of late Native American artist Allan Houser. The exhibition commemorates Houser’s 100th birthday this year and highlights his contributions to Native American painting and sculpture during his time as an active artist. The works displayed will center on the Indian Annual, an art competition sponsored by the Philbrook, which Houser both partook in and judged. Houser has a decorated history at the Indian Annual. He won the Grand Award (given to the best art piece in the show) a total of five times. In addition to those awards, Houser received the Waite Phillips Award for Lifetime Achievement in 1969 and judged the competition for 13 years from 1963 to 1976. Houser centennial appreciation is happening elsewhere in the state as well. The Oklahoma Museum of Art in Oklahoma City just concluded its exhibition Allan Houser: On the Roof.